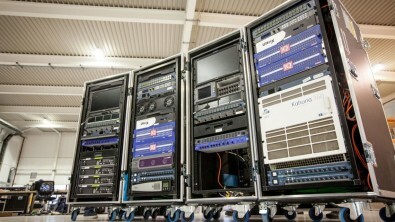 Creative Technology recently looked to ES Broadcast to expand and upgrade its remote AV services. The integrator used TSL Products’ TallyMan Broadcast Control System for three UHD Portable Production Units (PPUs) and one HD 3G PPU. The four new PPUs (roll-about racks) are designed to combine cutting-edge technology with simplified operability and a familiar system architecture to allow engineers to easily transition between new and existing systems. The racks include a Ross Ultrix FR2 12G UHD routing platform, with full demux/mux, frame-syncs, multi-viewers and room for storage. A demux/mux and MADI Core are also used to deliver enhanced audio capabilities. The racks are equipped with TSL MPA1 audio monitors, which are fully integrated via SNMP, and PAM-IP via Ember+. The systems include InSite management software to monitor for alarm triggers from any device within the system. The solution's applications range from OB truck and remote production to sports production and studios and is fully configurable in broadcast trucks with a one-button touch to set devices, share and manage resources between systems. In sports production, the solution can repackage fast-action production steps into pre-defined commands, which saves essential milliseconds that contribute to delivering a high-quality viewer experience. Most importantly, the solution is built on independent and protocol agnostic integration that provides the flexibility needed to choose best fit and best of breed with confidence, for new or existing systems. Creative Technology's client roster has included iconic sporting events such as The Wimbledon Championships and Ryder Cup, as well as live music events and the Olympics Opening Ceremonies.